To spark discussion, the Walker invites local artists and critics to write overnight reviews of our performances. The ongoing Re:View series shares a diverse array of independent voices and opinions; it doesn’t reflect the views or opinions of the Walker or its curators. Today, Penelope Freeh shares her perspective on Thursday night’s Live! The Realest MC by Kyle Abraham / Abraham.In.Motion. Agree or disagree? Feel free to share your thoughts in Comments! A golden child is hatched downstage right. Clad in sequins and lamé, Kyle Abraham is born. Shoulders articulate. Limbs elongate then shrink. Abraham tentatively balances on his sickled feet and, for a moment, he is grown. Soon other dancers enter and athletically frame him. Their movements are clear-cut and concise. Everything is clean and visible. 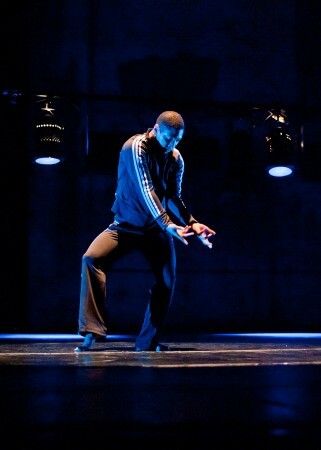 The oscillation from casual hip-hop to balls-to-the-wall contemporary dance is utterly discernable, readable. There is so much unison dancing that when an image stops for a moment, like when a trio of men sightlessly hug/spoon and reach for one another’s hands, we sit up and take notice. There is depth of meaning here that extends beyond the virtuosity of high battements and multiple turns. This piece is about coming of age, being gay, pain and rage. Video is projected on an upstage curtain of floor to ceiling white strips. Kids chase after someone over and over, a childhood nightmare played out larger than life and in color. The music is drone-like and full of static, at times too loud but to a point. Life is sometimes unbearable and dangerous. You want to cover your ears and hide away. At about the halfway point this full-evening piece breaks apart. Humor finds its way in by way of a video of a southern white woman giving a hip-hop tutorial. Next is a voiced-over dance lesson all about the hips. Later two men physicalize the same dance instructions, one effeminately and the other hip-hop style. A beautiful juxtaposition and, I think, complement. The evening is comprised of episodes rather than a super-narrative. This is elegantly done and with superb transitions. The lighting helps to carry this off, creating and defining sub-spaces within the larger one. The end brought my only complaint: I wanted the last dance episode to be a solo for Abraham. After making himself so vulnerable in a section where he by turns talked tough and broke into childhood tears, I wanted just him and his sublime musicality. Alas, I loved it anyway. From the dancers to the clever costumes, all were well cooked. For a work that drew upon the autobiography of Abraham, credit and generous dancing time was given to the dancers.